Businesses grow but not all business grows continuously. In fact continuous growth is elusive even for the ones led by the best of business minds. There may be periods of flatness or even temporary slump due to external environment but as long as a business turns up in quick time and resumes its growth journey, we may deem a business as growing continuously. Strategic performance involves articulating vision and formulating strategy. 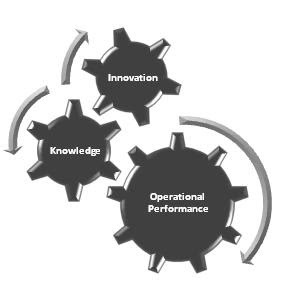 Competitive performance involves harnessing knowledge and innovating to achieve operational excellence. Operational performance involves delivering quality product / service on time at effective cost. The picture given alongside captures three layers of performance in a pyramid. Mostly people relate performance to operational performance. As long as the external environment is conducive and friendly to the business then efficient operational performance alone may suffice. However competitive pressures are part and parcel of today’s business environment and add to it the side effects of globalisation, companies can no longer rest on their operational laurels. They have to transcend competitive and strategic performance levels successfully in order to grow and maintain the growth momentum. Operational performance involves successfully delivering on three traditional yardsticks viz., Time, Quality and Cost. The operational mantra is to consume optimal resources and delivering high quality of work in the least possible time. A company sans operational issues and problems would deliver on operational yardsticks 24x7. In the absence of any changes in the environment this performance would suffice for a company to be competitive. However changes in the environment induced by the market / competition / economy / regulation / society etc. can derail even the best of companies priding in efficient operational performances put up yesterday. It would not be suffice to deliver efficiently (by yesterday’s standards) when the environment is constantly changing. In a changing environment, what is efficient yesterday is not efficient today. A company needs to learn, know, adapt and innovate in order to remain competitive and lead the pack. It has to evolve and dump work practices, policies, systems, products, services, technology etc. that were rendered obsolete by the environment. Companies that harness knowledge and foster innovation enrich their operations and constantly raise the bar. These companies will remain competitive and often capture the best of the market. 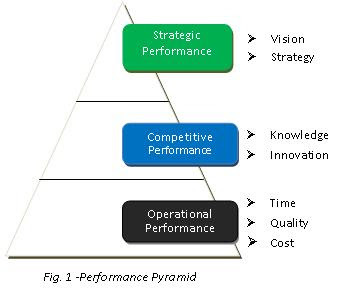 The competitive performance factors viz., Knowledge and Innovation become a source of improvement for performance on operational yardsticks viz., Time, Quality and Cost. An operationally efficient company achieves operational excellence by managing and exploiting its competitive performance factors. A strong Operational performance means operational efficiency. A strong competitive performance means operational excellence. Happy to note that.You are welcome. Well I acquiesce in but I contemplate the collection should prepare more info then it has. Yeah this post is just a starter for the topic. I intend to cover each part in little more detail. Pre-occupation with work is delaying my next post in this series. It's near completion and I should post it soon. Thank you. I have a twitter account with the user name 'balajhi' and I post links there whenever I post here. Well your article helped me truly much in my college assignment. Hats off to you send, intention look forward in behalf of more related articles promptly as its one of my favourite subject-matter to read.